This is a story – the silliest tale – of how we arrived at Hilary Snail. We’ll resist the urge to continue this post in rhyme, but that is exactly how The Adventurous Tale of Hilary Snail was born. 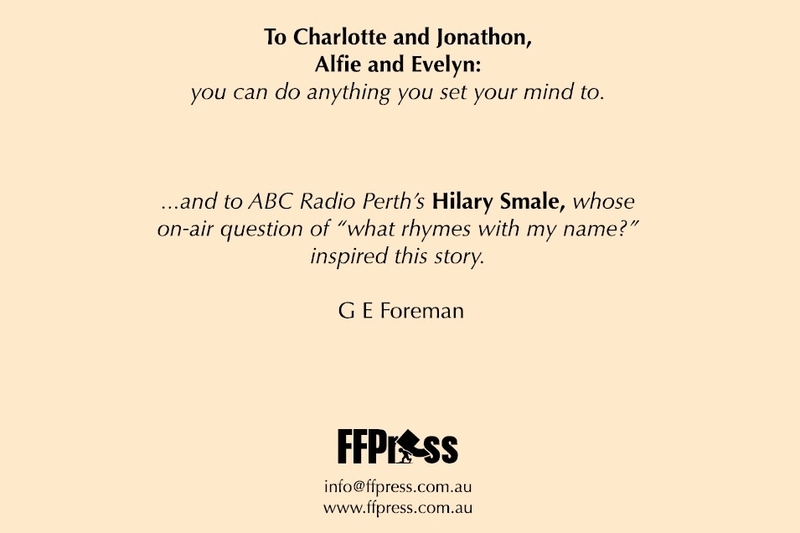 “I was in the car with the kids one day and we had ABC Radio Perth on,” author Glen Foreman said. Foreman, who in a past life won a WA Music Industry award for hip hop, put his love for rhyming to use. “I wasn’t going near ‘Varischetti’, because outside of ‘a plate of spaghetti on a Paris jetty’, I had nothing,” he said. He then pieced the rhymes together into a coherent storyline while taking the children – Charlotte, 4; Jonathon, 2 – for a walk the next morning. However, the journey to a published children’s book was far from complete, as the words needed pictures to accompany them. Foreman approached close friend and former work colleague from the WA Cricket Association (WACA) Ash Storey, who designed the cover for FFPress’ first publication The Legend from Bruce Rock: The Wally Foreman and whose children – Alfie, 3; Evelyn; 1 – were similar in age. “Glen did what Glen does, which was come to me and say ‘I’ve got an unfinished idea – do you want to finish it for me?’,” Storey said. “My initial response was, ‘Yes, of course, what a cool thing to be part of’, but I was completely naïve to the huge task ahead of me. “I had an image in my head of how I wanted Hilary to look, but the challenge with any design is always the link between brain and hand and the main challenge I had was striking the balance between anatomically correct and cute. “I spent hours sketching and was feeling somewhat defeated, until my wife leant over my shoulder and said, ‘Aww he’s cute’ – pointing to a tiny snail in the middle of a mass of scribble – and once I’d chosen the design and developed a style that I could replicate, the rest followed pretty naturally. “It’s something I’ve always wanted to do and it was a real pleasure to work on (the way that people find running marathons pleasurable). The initial plan was for The Adventurous Tale of Hilary Snail to be a private publication to surprise their children, but when Foreman received the stunning artwork from Storey, he knew the book needed to be published publicly. It would only be right, in that case, if the inspiration behind Hilary Snail was on-board with the idea. So, Foreman reached out to ABC producer, Smale. “Glen e-mailed me last year out of the blue, explaining that he’d penned a short story with his kids after hearing me on the radio,” Smale said. “I was tickled pink to find out about the story initially, then stunned and very excited to hear that it was actually going to be published into a real book. “I feel very honoured to have such an independent and adventurous snail named after me. “Hilary Snail is a wonderful character who believes in herself and tracks her own path in life – how cool is that? Pre-orders for The Adventurous Tale of Hilary Snail are open now via FFPress, with shipping expected to commence by the first week of December. The title is expected to be available for ordering/purchase in-store and online at all good bookstores by the first week of December (NB: subject to change).